You've found the “U.S. Pygora Goat Breeders” page here at Hobby Farm Wisdom! If this is the first time you have visited our site: Welcome! 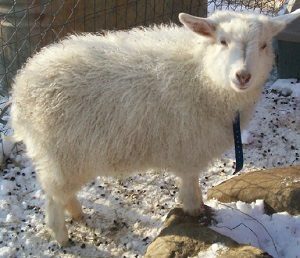 A result from crossing a Pygmy and an Angora goat, the Pygora breed is a fiber goat that can produce three different types of fleece. They live between 12-14 years and are sometimes used as show animals. Does range in weight between 65 – 75 lbs and bucks 75-95 lbs. The fiber they produce is used for spinning, spindling, knitting, crocheting, weaving, tapestries, clothing and other fiber arts. Pygoras produce one liter of milk per day. Wethers generally have higher quality fibre than bucks. They produce cashmere-like fleece, mohair-like fleece and a combination of both. These goats come in a variety of colors: white, red, brown, black, gray or a mix. Pygoras are docile and playful and very curious creatures. A registered Pygora must not be more than 75% Angora or Pygmy.